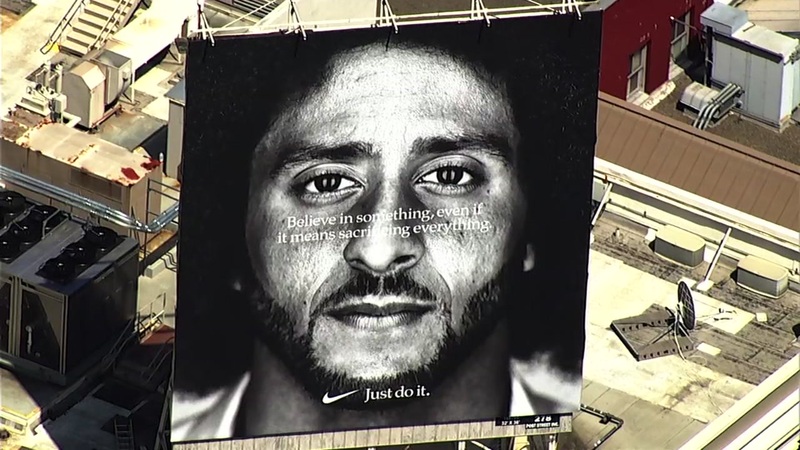 High above San Francisco’s Union Square is a giant visage of former San Francisco Forty-Niners quarterback Colin Kaepernick adorning a newly erected billboard atop the Nike store. Once considered a promising professional athlete with an NFL career ahead of him, Kaepernick chose to throw all of that away. Claiming that he was standing up for racial injustice and inequality, Kaepernick chose to sit and then later stand during the National Anthem. Many Americans view this as a sign of complete disrespect to the military, first responders, and the police. As the now unsigned Kaepernick has now turned to activism — and has become the new face of a controversial Nike “Just Do It” ad campaign, his face now overlooks the city of San Francisco the way the city looks at the rest of America – with contempt. Neither seems to grasp the concept that a complete and utter LACK of respect does not in any form or fashion beget respect in any fashion. “Believe in something. Even if it means sacrificing everything,” reads the text scrawled across a black-and-white photograph of Kaepernick’s face with a minuscule “Just Do It” and Nike swoosh logo hovering over his stubbled chin. The implications are clear. Yet, Kaepernick will allegedly make significantly MORE money as a Nike spokesman than he ever would have made as a backup quarterback for a midmarket NFL team. The idea that Kaepernick “sacrificed everything” or anything at all is simply laughable. The man is no martyr. He chose to make a political statement while on the job, and in so doing turned himself into a liability. That liability meant teams were unwilling to take on the distraction that would involve adding Kaepernick to their team roster. Teams simply are unwilling to undertake that level of distraction and backlash for second and third-string talent. Through a series of decisions Kaepernick chose to make, he got himself reportedly blackballed by the NFL and leveraged it into a sweet gig with Nike. That is not exactly the stuff of martyrdom. The irony missed by the city of San Francisco, the state of California, the activists and the politically correct supporting this, and Kaepernick himself is that while Kaepernick is kneeling for “injustice” and allowing his visage to be used as an advertisement, Nike continues to exploit children and women in sweatshops to make their products for pennies a day. A practice Nike has long been guilty of, the company expects the American consumer to pay a premium for a little check mark on the side of the shoe. Meanwhile, the fact that their ridiculously overpriced merchandise has long been allegedly manufactured on the backs of women and child slave labor is the REAL injustice. Reportedly, the company’s workers in some countries still have to deal with denial of wages, sweltering heat, unsafe conditions, physical abuse, and other hazards. Where is the billboard for that San Francisco? Who is kneeling for that Kaepernick? It seems when it truly comes to legitimate injustice there is nothing but crickets.